Since 1974, the Mary Kay Seminar has brought thousands of attendees to downtown Dallas to recognize and motivate its Independent Beauty Consultants. From July 20th to August 4th, Mary Kay Independent Beauty Consultants will gather from around the globe for the 44th Annual Convention to celebrate their accomplishments and kick off new goals. For decades, Y.O. 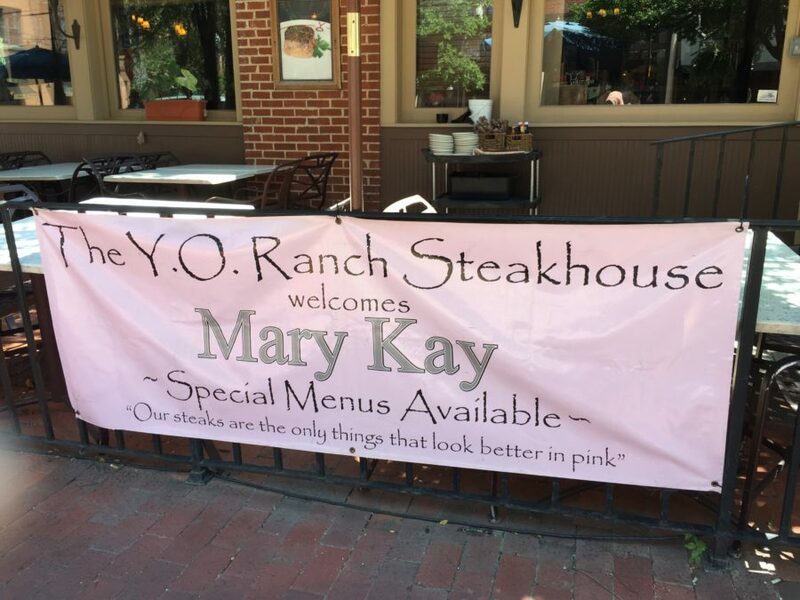 Steakhouse has been proud to serve hard-working, ambitious, and accomplished Mary Kay convention attendees throughout their stay with a specially created a la carte menu. Although Mary Kay is a Dallas-based company, its Independent Beauty Consultants are located around the world. The Mary Kay Convention is a wonderful opportunity to explore the rich Dallas history and the Texas hospitality our great state is known for. Whether it’s your first time in Dallas or you’re an annual visitor, Y.O Steakhouse provides you with both experiences. From our traditionally decorated dining room, complete with 100-year old brick arches, iron accents, and historic black and white tables, to our authentic and unique Texas menu items, your lunch or dinner at our downtown Dallas restaurant will certainly be one to remember! One of the reasons Y.O. Steakhouse is considered one of the best steakhouses in Dallas, and in the nation, is because of our unique menu items that provide a perfect balance between tradition and innovation. Our Mary Kay Convention specials are hand-picked by our chef and certainly sure to please! Kick off your Y.O. Steakhouse experience with one of our scrumptious starters. Select from fresh, healthy items such as our Caesar Salad, Y.O. House Salad, or Burrata Tomato Salad, featuring Burrata di Bufala, beefsteak tomatoes and fresh basil, drizzled with extra virgin olive oil and balsamic reduction. You won’t want to miss out on our Pimento Cheese Fritters and Smoked Sweet Corn Bisque, both exquisitely Texan and full of flavor! No matter how you decide to start your journey through lunch or dinner, be sure to accompany your meal with one of our Mary Kay drink specials – the non-alcoholic Pink Lady, featuring lemonade mixed with organic prickly pear cactus juice served in an extra tall glass with a sugar rim, or the Mary Kay Cocktail, which includes all the same ingredients as the Pink Lady with an additional spike by Kettle One Vodka. Naturally, if you’re visiting a Dallas steakhouse, there’s a good chance you’re going to want to try one of our world-renowned steaks. We’ve got the best of the best cuts for our Mary Kay guests, such as the Filet Mignon, Ribeye, and New York Strip, all served with mashed potatoes and mixed veggies. After decades of serving Mary Kay Convention guests, we’ve noticed that there are definitely some menu favorites. Our Shrimp and Grits include Texas gulf coast shrimp, bacon, portobello mushrooms, tomatoes and scallions over cheesy Tabasco grits. The Chicken Calvados features pistachio crusted chicken breast with granny smith apples, whole grain mustard, and apple brandy cream served over wild rice. The Red Chili Rubbed Salmon is also sure to please, dressed perfectly with cilantro butter and served over wild rice and grilled veggies. Eating healthy? We’ve got something for you, too! Our Sirloin Salad is equally delicious with tomatoes, blue cheese crumbles, and fried tortilla strips, tossed with a garlic cilantro vinaigrette and topped with grilled sirloin. Our Downtown Dallas Restaurant is Excited to Serve You! We’re proud of the accomplishments of our fellow Dallas-based friends at Mary Kay, and we believe you deserve only the best! Come try what Jim O’Connor of the Food Network declared “one of the nation’s finest steakhouses.” Hop in your car, the DART train, or walk on over for an experience of a lifetime. All you need to do is make a reservation! We look forward to seeing our old friends at Mary Kay that visit every year and look forward to making new ones, as well! On behalf of everyone in the Big D, we hope you enjoy your stay in Dallas!